You’ve no doubt heard of Murphy’s Law: If anything can go wrong, it will. I’ve recently discovered a similar universal truth. I’m thinking of calling it Klein’s Thermostat Theorem. It goes something like this: In any room containing more than one person, the thermostat will invariably be set so that half the people will be too cold, and the other half too hot. The follow-up truth, which we might call the Cold Feet Corollary, is that If only one person is in the room, half of his body will be too cold, and the other half too hot. And then there’s the Air Adjustment Adage, which states that, Any adjustment to the thermostat will please no more than half the people in the room and only make matters worse. 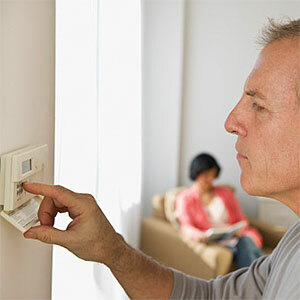 Despite the obvious truth of the Air Adjustment Adage, many people constantly attempt to adjust the thermostat in an effort to make themselves more comfortable. After many years of observation, I can now state with great assurance that 98.3% of the time, adjustments made to the thermostat are aimed at benefiting the person doing the adjusting (or those with similar body temperatures). The remaining 1.7% of adjustments are made to benefit either someone lying in a hospital bed or the President. In Philippians 2:4 God commands, “Let each of you look out not only for his own interests, but also for the interests of others.” Here then is a principle that should guide Christians not only in adjusting thermostats, but also in many other every day actions. When it comes to matters of personal interest, where there is no right or wrong (like the temperature of a room), we ought to be at least as concerned about others as we are ourselves. The critical issue here is not the temperature of a room, but learning to “walk in love” (Ephesians 5:2). Love “does not seek its own” (1 Corinthians 13:5). Love cares as much for the welfare of others as it does for its own welfare. The Lord Jesus who, “loved us and gave himself up for us” pleads with us to follow in his steps. “Let all that you do be done with love” (1 Corinthians 16:14).